Emergency Department/Trauma Services Director Daman Mott confers with Chief Nursing Officer and Vice President Kathy Richerson. After years of planning, hundreds of hours of staff training, drills and paperwork, NorthBay Medical Center is Solano County’s first Level III Trauma Center. “This is a real victory for the citizens of Solano County who will no longer have to take their injured 45 minutes away to a trauma center,” says Gary Passama, president and CEO of NorthBay Healthcare. The designation came after a team from Solano County toured NorthBay’s facility to ensure that all the requirements and criteria are met. The process was initiated by NorthBay in July with a formal letter to the county seeking designation as a Level III trauma center. “This process was not just new for NorthBay, it’s new to all of Solano County,” explained Ted Selby, Solano County’s emergency medical services administrator. The county had to create standards, and did so by reviewing the health and safety code regulations that all healthcare organizations must meet to be designated as a Level III trauma center. Selby then sent his team to Washington state, where they were able to shadow a team of surveyers who were visiting a hospital seeking to renew its designation. “We thought it would be beneficial to see firsthand how other government agencies conduct their designation process to ensure a high quality process for Solano County,” said Selby. The designation means that emergency medical services personal will be able to bring most trauma patients, with the exception of neurological cases, to the Fairfield facility’s Emergency Department for treatment. Both of NorthBay’s hospitals—NorthBay Medical Center in Fairfield and NorthBay VacaValley Hospital in Vacaville—handle trauma cases already, but those are “walk-ups,” or “drive-ins,” with the transportation handled by the patient or family and friends. Once an ambulance or helicopter team is involved, (such as when 9-1-1 is dialed) protocol previously required serious trauma be sent to the nearest Level I or Level II trauma center. That has meant a ride or flight to Walnut Creek or Sacramento. Now NorthBay will be able to handle the majority of these cases right here in Fairfield. There are about 1,000 trauma cases a year in Solano County, according to state statistics that show 42 percent are transferred out of the county. Most are a result of traffic accidents (50 percent) and falls (39 percent). Less than 7 percent of traumatic injuries are a result of assaults. Solano County is one of the few counties its size within California that did not have a designated trauma center within its boundaries. During the process, NorthBay has worked closely with the county Emergency Medical Services agency and with providers and first responders who will bring trauma patients to NorthBay Medical Center. Level IV facilities are capable of providing emergency care and have agreements in place to transfer trauma patients to higher level facilities. Level III facilities are capable of handling most trauma cases, offering surgical, cardio-vascular, obstetrical and orthopaedic care. Level III facilities do not offer neurosurgery on a 24-7 basis. Level II facilities are capable of tending to all kinds of trauma, including neurosurgery cases. 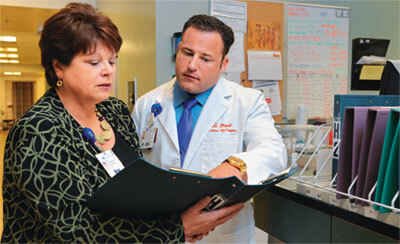 Level I facilities handle all types of trauma cases and serve as both teaching and research facilities.